Show us your fancy footwork with this football themed exotic slots game! Jungle Goals has the bonus features to keep you spinning to win big! 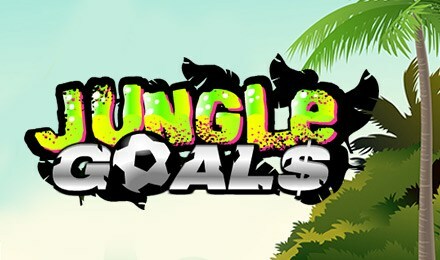 Escape into the Brazilian Jungle and demonstrate your phenomenal football skills with Jungle Goals Slots! It would be wise to get your vaccines before your exotic travels or you may catch football fever! Travel to the sticky tropics and spin to win big in this progressive jackpot game with big payouts. This five reel game with nine fixed paylines, two Wild Symbols, as well as a gold trophy Scatter Symbol will have you out of breath. Be sure the ref doesn’t hand you a red card!